Much like regular grills, portable ones come in two main varieties – charcoal and gas. As you might already know, food cooked on charcoal grills generally tastes better, as it absorbs that smoky flavor from whatever wood chips you’re using. However, it also takes a lot longer to properly grill burgers and hotdogs on charcoal if you want to achieve that smoky flavor – and you don’t want to keep your ‘toon guests waiting all day. On the other hand, gas grills are faster but don’t make your burgers as flavorful as charcoal ones. They’re usually lighter as well, as they only need one propane cylinder to keep them running all day. We would recommend going with a gas grill for your pontoon deck, as they are lighter, easier to use, and usually cheaper. However, you can also find tons of charcoal portable grills online if that’s what you’re after. 2. Rail mount or Tabletop? You can, of course, get a regular portable grill and keep it on your pontoon’s countertop. However, that will leave you with no ‘kitchen’ space to work with. You’ll have a hard time assembling the burgers and hotdogs after taking them off the grill, as well as pouring drinks or whatnot. We’d recommend going for something with a rail mount instead, such as the Extreme Marine Products Cuisinart Grill Modified for Pontoon Boat with Arnall’s Grill, which mounts to 1.25″ square pontoon boat railing. With the grill mounted nice and snug on your pontoon railing, you can have the whole tabletop counter to yourself, and use it for pre-grill and post-grill prep. This is more of a matter of preference, and we can’t really say we prefer one over the other. Round grills are usually smaller, thus more appropriate for small families and/or parties. They also consume less fuel and cook your food quicker than larger rectangular units. On the other hand, rectangular units are larger, allowing larger amounts of food to be cooked at the same time. If you’re used to hosting 10+ people on your ‘toon at a time, you should probably opt for a rectangular grill. This would be everything you need to consider when choosing a grill for your pontoon boat. 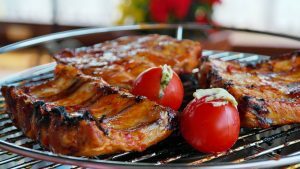 We hope these tips helped you make the right decision, and transform your dreams of a bbq party on board into reality.